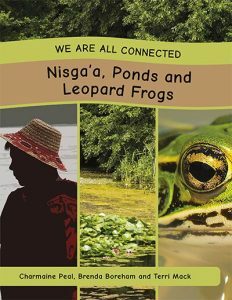 We Are All Connected: Nisga’a, Ponds and Leopard Frogs is one of a series of books that looks at different Canadian ecosystems, indigenous connections to the ecosystems, and an animal that lives within each ecosystem. Through an interview with Charmaine Peal, a member of the Nisga’a territory, the reader learns what connectedness means to her; about the landforms, plants, trees, and foods of her territory; the clan system and her language and cultural practices. 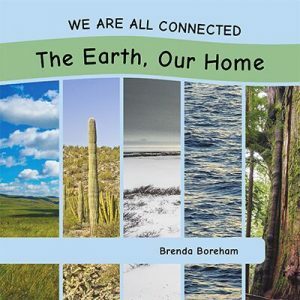 We Are All Connected: The Earth, Our Home is a foundational book in the series that provides more in-depth learning about biomes, ecosystems and biodiversity. This book provides additional information about important concepts and terms in Nisga’a, Ponds and Leopard Frogs for both students and teachers. The use of inquiry and questioning is used to frame sections of both books. 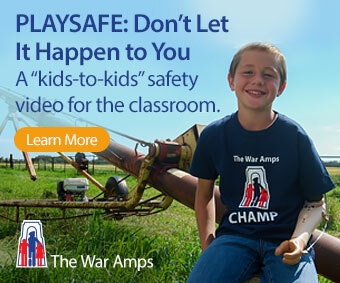 The examples of photographs with captions or labels is an excellent model for students to learn about these text features. The word boxes also provide students clear definitions of the boldface words in the text. Many of the pages also include “Did You Know?” circles which provide quick, relevant facts. Classroom Connections: Nisga’a, Ponds and Leopard Frogs and The Earth, Our Home are excellent resources to help meet the learning objectives of Canadian provinces and territories, and specifically the new British Columbia Social Studies and Science curriculums. This series addresses the core competency of identifying First Peoples perspectives and knowledge as sources of information, and the content of First Peoples concepts of interconnectedness in the environment. With such a good focus on Canadian content, educators will find these resources helpful in teaching students about the diverse ecosystems of our country. These books would be helpful in starting students on their own inquiry-based projects about ecosystems and animals and serve to raise awareness of indigenous perspectives. The clear, detailed format organized around questions and answers could be a model for students to set up their own projects.